In the White Drake's war, the price of freedom is paid in blood and fire . . .
A drake of unimaginable power has risen, and it commands an army of both beasts and men. Rogue Blood-blessed Claydon Torcreek, Syndicate agent Lizanne Lethridge and Ironship captain Corrick Hilemore have been spread to disparate corners of the world, but they are united in their desire to defeat the White Drake and the Spoiled who follow it. Humanity itself is at stake, but with the aid of ancient knowledge, revolutionary technology and unexpected allies, all hope is not lost. Saving the world will require sacrifice, as Clay, Lizanne and Hilemore will see all they know either consumed by flames or reborn from the ashes. 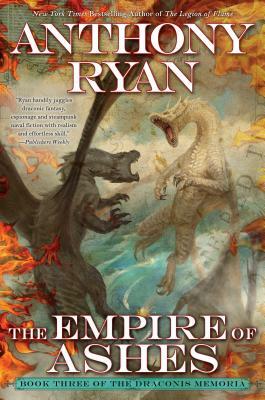 Anthony Ryan is the New York Times bestselling author of the Raven's Shadow novels, including Blood Song, Tower Lord and Queen of Fire, and the Draconis Memoria novels, including The Waking Fire and The Legion of Flame.